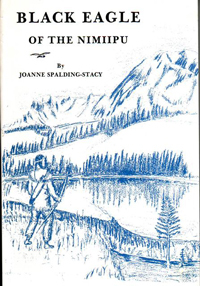 Spalding-Stacy's 1995 book Black Eagle of the Nimiipu follows the story of a small Nez Perce girl and boy who lose their families and their entire village in an avalance. All alone, they learn to survive in the wilderness along the banks of the Salmon River and, as they reach adulthood, they start their own family. Spalding-Stacy's great-grandparents moved to Idaho in 1836 to work as missionaries to the Nez Perce. The author says that it was her family that instilled in her great respect and affection for the Nez Perce people. It was also while researching her family history that Spalding-Stacy stumbled upon a brief mentioning of the two orphaned children and was so moved that she felt compelled to write the book.